thAmaraik kaNNAvO! thaniyEn thani ALAvO! thAmaraik kaiyAvO! unnai enRukol sErvadhuvE! nAbA – oh one who has divine navel! pAdhA – oh one who has divine feet! kaNNA – oh one who has divine eyes! kaiyA – oh one who has hands! ALA – oh master who can rule me! Oh one who has divine navel which is having lotus flower, and who created the vast universe which has three types of worlds such as kruthaka, akruthaka, kruthAkruthaka! Oh one who has the infinitely enjoyable lotus flower like divine feet which measured such universe to claim exclusive ownership! Oh one who has attractive lotus like divine eyes! Oh one who has distinguished lotus like hands! Oh master who is unique in eliminating hurdles and can rule me, who is helpless due to abundance of hurdles! When will I reach you who are apt, enjoyable and protector, in this manner? The presence of “O!” at the end of each line indicates the great sorrow. pAmaru mUvulagum padaiththa paRpanAbAvO – pA indicates an entity, implying abundance of entities; that is – the three worlds which have abundance of entities. pAmaru can be seen as a single word, and in that case, it would mean the three worlds which are filled with pApa (sins). (another explanation – pA indicates vast, indicating worlds which have vastness). mUvulagam indicates the worlds which are in the top, middle and bottom layers; alternatively, it could mean kruthaka, akruthaka and kruthAkruthaka. padaiththa paRpanAbAvO – Like calling out “oh my mother!” Does he only have the aptness [natural relationship]? Would I not be relaxed if he did not have the enjoyability? [i.e. he has an enjoyable form with beautiful lotus flower in his divine navel] Did you create these only to destroy them? Why are you destroying the existing entity [me], while you are creating new entities [during creation]? pAmaru mUvulagaLandha – Would I not be relaxed if you created them and let them fend for themselves? You are carefully protecting them, like a mother. While I who have great desire as said in thiruvAimozhi 9.2.2 “padikkaLavAga nimirndha nin pAdha pangayamE thalaikkaNiyAy” (Your divine, lotus feet which rose matching your form are the decoration on my head), you are placing your divine feet on those who have no desire! Are you not the one who would redeem this earth by crossing the boundary, when those persons such as mahAbali et al capture the worlds like an eagle catching its prey? thAmaraik kaNNAvO – We depend on you for our creation, nurturing and life on you only; AzhwAr is saying to emperumAn that he should glance with his divine eyes as said in SrIvishNu purANam 1.20.16 “avalOkana dhAnEna bhUyOmAm pAlaya” (Oh lord! protect me with your glance). So, he meditated upon the beauty of the divine eyes; but he did not see his presence amidst the nithyasUris who consider the beauty of those divine eyes as their life; so, he identifies himself to be thaniyEn (lonely one). thaniyEn thani ALAvO – Oh one who rules me by placing in a third position beyond the material realm where everyone sustains himself by the glance of women and the spiritual realm where everyone sustains himself by your divine glance! Alternative explanation – as I am fully dependent on your mercy, you made me the full (lone) target of your eyes and are ruling me! thAmaraik kaiyAvO – Would I get like akrUra? SrIvishNu purANam “sOpyEnam …” (akrUra kept thinking about krishNa’s features throughout his travel and was embraced by krishNa when they met) – krishNa touched him such that all the features of his divine hands were imprinted on akrUra’s body and as akrUra stood dumbfounded by that touch, he himself picked up akrUra’s hand, and embraced him so tightly that two persons were not seen there. As said in hari vamSam 275.15 “karENa mrudhunA dhEva: pApAnni: mOchayan hari:” (With his tender hand, krishNa touched the body of gaNtAkarNan). unnai enRukol sErvadhuvE – Would you only fix a date for your younger brothers as in SrI rAmAyaNam yudhdha kANdam 127.1 “pUrNE chathurdhaSE varshE panchamyAm” (on the panchami (fifth day) after fourteen years)? Should you not specify a date for your distinguished servitors saying “you will get it on this particular day”? A servitor should wait for the master to grant it on the day he (master) wishes. But I am unable to be patient in that manner. 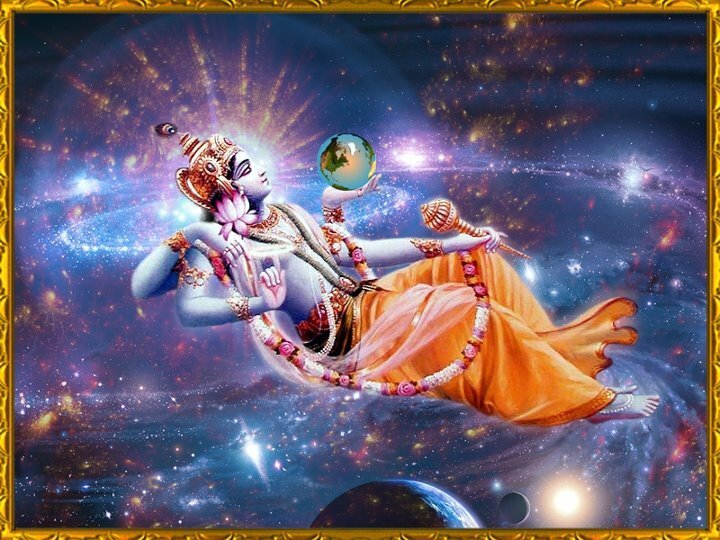 thaniyEn – unnai enRukol sErvadhuvE – A nAra (sentient) cannot live being separated from nArAyaNa (the lord); now, reaching/uniting means – uniting with the assembly of nithyasUris as said in thiruvAimozhi – 2.3.10 “adiyArgaL kuzhAngaLai udan kUduvadhu“. How will we derive this meaning when AzhwAr says “unnai enRukol sErvadhu” (when will I reach you)? Since it is said in thiruvAimozhi 4.9.10 “oNdodiyAL thirumagaLum nIyumE nilA niRpa” (While SrImahAlakshmi, the one who is having distinguished forearms with ornaments like bangles, and you stand alone), this meaning will be naturally derived [i.e. in paramapadham, while innumerable nithyasUris (eternal associates) including other consorts of emperumAn and mukthAthmAs (liberated souls) are present, in this pAsuram only emperumAn and pirAtti are said to be present – this implies that everyone is subservient to them. Similarly, when emperumAn is mentioned, it implies the assembly of his devotees]. This entry was posted in thiruvAimozhi, thiruvAimozhi 7th centum on September 16, 2018 by Sarathy Thothathri.